After conducting a study on both rats and in a test tube, the doctors found that Royal Jelly may prevent osteoporosis by enhancing intestinal calcium absorption. Basically, it helps you absorb more dietary calcium into your system. Calcium is a tough mineral to absorb - much of it passes through your intestinal tract and ends up in the toilet. 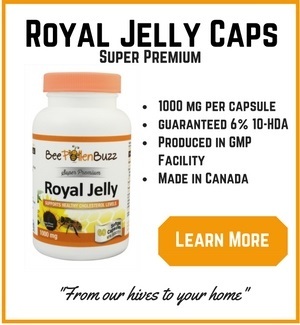 So if Royal Jelly can increase your ability to absorb calcium, this would make it an effective preventative aid for osteoporosis, according to the scientists. This sure is promising for those who have concerns with osteoporosis or osteopenia, both preventing or treating it. I recommend taking four 1000 mg capsules a day to promote bone health as well as other royal jelly health benefits. Build more bone. Read more here.